It really was just a matter of time until Quentin Tarantino made a spaghetti western. The genre obviously influenced his style, so it makes perfect sense that he would attempt to try his hand at one eventually. The majority of Tarantino’s films can be arguably defined as a reinvention of classic, but also slightly neglected genres. They are an idealized and romantic look back at what certain genre movies of the past were in the minds of fans. Tarantino operates within these cult genres, and his films revitalize dormant styles with a modern twist. That often limits the appeal of Tarantino’s films. He has broken into the mainstream, but his unique style isn’t for everyone, nor will it likely ever win over people set against him. In his newest offering, that hasn’t changed – even if it is one of his best films yet. Django Unchained is Tarantino’s (overdue) take on spaghetti westerns. Even the name “Django” is an homage to the 1966 Sergio Corbucci film, Django, which was memorable for being dubbed the most violent movie ever made at the time. Django Unchained shares the violent sensibilities of its 1960s namesake, as you would expect of a Tarantino film, but the story similarities end there. Set immediately prior to the Civil War, the movie is dominated by the specter of slavery, and Tarantino handles the issue with the same delicacy in which he has always handled sensitive subject matter – i.e. not at all. He runs head first into the topic and paints a horrific picture of the institution, but does so in a way that doesn’t define the film as you might expect. It is an inexorable element of Django Unchained, of course, but Tarantino satirizes several aspects of slavery in a way that allows you to laugh at a few of the more absurd characteristics of the institution, instead of crying at what is among the worst and most despicable periods in human (and especially American) history. It might come across as insensitive – and it can be – but there is never a moment when it overwhelms the film. It becomes almost secondary to what is first and foremost a spaghetti western with a comedic tint, as seen through the lens of Tarantino. The film is essentially broken into two parts, each of which carries a different tone and theme. It doesn’t have a specific break point as many other Tarantino films do, but there is a notable shift at about the half way point. The pacing also changes because of it – which presents a few problems late in the movie – but it doesn’t detract from the overall quality. The first half is a mentorship story, complete with a training montage. The real star of this section is the travelling bounty hunter, Dr. King Schultz (Christoph Waltz). Schultz is a gentleman and a scholar, as well as a cold blooded killer. The character is actually somewhat similar to Waltz’s role as the strangely charming Nazi in Tarantino’s Inglorious Basterds, just minus the indefensible background and villainous tendencies. 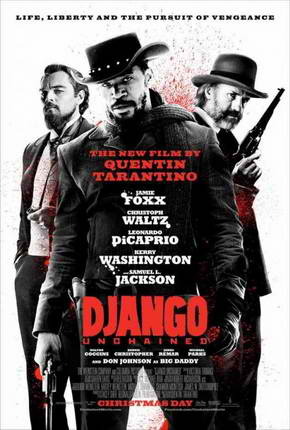 While in pursuit of a trio of brothers, Schultz encounters the slave, Django (Jamie Foxx), who can help identify his current prey. Together the pair track down their bounty and form a friendship of sorts in the process. Waltz is the clear star at this point, both in his character and his performance. He is electric, and using the witty dialogue Tarantino feeds him, every scene he is in is a good one. Waltz drives the movie and is responsible for many of the film’s funniest moments. 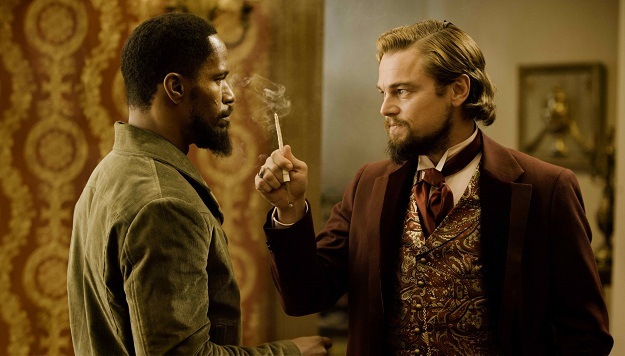 The second half of the film focuses on the transformed Django, as he begins to search for his wife (Kerry Washington) who was sold to the infamous plantation owner Calvin J. Candie (Leonardo DiCaprio). At this point Foxx takes control and becomes the star of the film, a role he dominates and excels in. The biggest surprise though is that of DiCaprio as Candie. He oozes charm and repugnance in equal parts, and with the help of his butler and confidant Stephen (played with gusto by Samuel L. Jackson), he is one of the most interesting villains on screen this year. Both sections have their merits, and they combine to offer one of the most original – and entertaining – films of the year. Fans of spaghetti westerns will feel right at home and appreciate what Tarantino is doing, while those unfamiliar with the genre will see an idealized and modernized take on what made the movies into cult favorites to begin with. It is also very much a Tarantino film, with all the good and bad that comes with it. Those that don’t like his style – the twisted banter and heavy use of ultra violence especially – won’t find anything to change their minds here. His fans will argue about where this film rates in his library for years to come, but it will certainly be near the top. The film has a few issues though, primarily with the pacing. The first half of the movie is a series of action pieces linked through humor, as the duo hunt bounties. The second part takes on a much slower narrative, as it is all setup to the end goal and relies heavily on dialogue rather than action – albeit witty and original dialogue. But there is a noticeably slower pace once the plot changes. That doesn’t take away from the overall product, but there are a few moments that drag. It feels a bit like two movies crammed into one, and the first is the better – but only marginally. This is a fairly minor complaint though, and even at its slowest Tarantino manages to throw in some intriguing visuals, good banter, and/or something outrageous to distract you from the slower pace. Tarantino’s foray in the world of spaghetti westerns is handled with his usual aplomb and gusto. There are a few moments in the second half of the film where the pacing falters, especially compared to the first half, but it is a temporary hiccup and the climax brings everything to a good resolution. The issue of slavery is never going to be an easy one, nor should it be, but Django Unchained allows it to speak for itself without becoming the sole focus of the film. That will likely turn some people off, and that’s fair. But they will be missing one of Tarantino’s best films, as well as one of the best films of 2012.